On December 12, 2013, Trinity’s Mid-Atlantic Assistant VP, Dave Heller, and Operations Manager, Mike Dodson, attended the 2013 Vidyo Technology Showcase Partners meeting held in Arlington, Virginia. 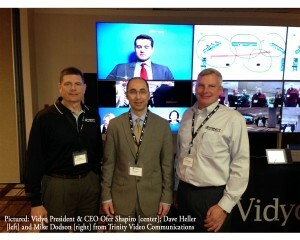 The Vidyo leadership and staff proudly demonstrated their newest innovative technology with the release of Vidyo 3.0. Trinity Video Communications provides video, audio and other communications options for commercial, healthcare, legal and law enforcement, education and government applications. Trinity is based in Louisville, Kentucky, and also has offices in Cincinnati, Ohio and Sterling, Virginia. Trinity has a number of government contracts and holds a GSA Schedule 70, with 75% of its employees holding Top Secret clearance. Trinity Video Communications specializes in secure, mobile applications, linking any device, any time, anywhere. If you would like more information about Vidyo and how it can transform communication within your organization, contact a Trinity Video Communications representative today at 1-800-261-9008 .